Ladies V neck top, states size 12 but is size 20/22. Condition is Used. Dispatched with Royal Mail 1st Class. 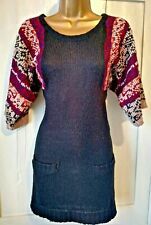 Sweet scandi style BOHO tunic dress with pockets and multi coloured wide half arms, slim fitting and cosy. I am an ex fashion stylist magpie based in NYC for 5 years and London for 10. My style influences are 70’s ethnic rock chick Victoriana. Apricot fitted knit bodycon dress from New Look. Black all over with a camel could pattern on the front. Labelled a size L which is a 14/16 according to their website. Never been worn. You can tell this as it still has that new feel. Purchased last year and forgotten about. Will upload tracking info once posted. Will combine postage on multiple purchases. Happy to post overseas using the global shipping programme. Sorry no returns. Any questions, please feel free to ask. Pretty black dress with white crochet detail Only worn once Size L From Apricot All our items come from a pet free and smoke free home. Apricot black check jumper dress 32" bust, waist 30", hips 36"
Ladies dress from Apricot. Size M (12). Apricot Dress / Long Top Size M . Condition is Used. Dispatched with Royal Mail 2nd Class. 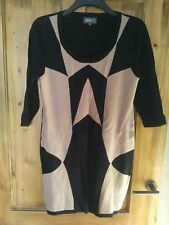 apricot dress size 8. Condition is Used. Dispatched with Royal Mail 2nd Class.